My love for the effort that Zen Studios puts into keeping their much-loved Pinball FX2 active with fresh new DLC has not seen the light of day on this website as yet for some strange reason. With me being a massive fan of their work since I purchased the very first Pinball FX for my 360 wayyyyyy back in the day. Since then, they actually played a massive role in me typing these very words today, with Pinball FX DLC being my first very attempt at a review (never go looking for it) on the Intenet back when it launched. Since then they have always had my back with codes for new games and tables, which is why I'm sitting here about to type a few words on their two table Marvel DLC pack for Pinball FX2, which is coming to a bunch of formats from September 27th. Now before we get ahead of ourselves here, we all know my lack of knowledge when it comes to Marvel right? I don't think I've made it clear on here just yet how I'm not one of those gamers that seem to love everything superhero, as while I watch the movies and things from time to time, I don't jump around like a kid who has eaten a bowl of sugar when a new trailer drops for a new film or anything. This being said, I do appreciate me a nice looking table, and Zen have been doing that since I can remember. 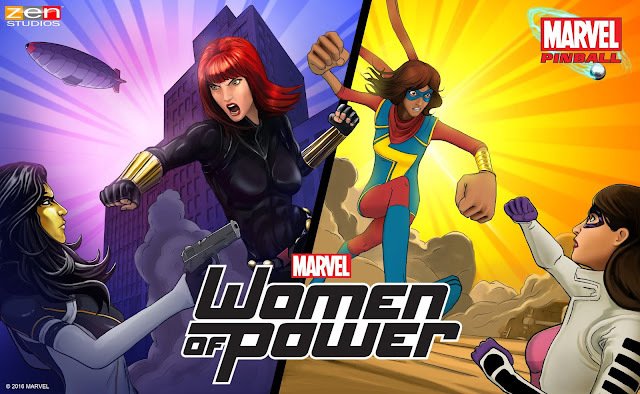 The twin table pack will offer the likes of Ms. Marvel, Black Widow, Squirrel Girl and many more (I know of Black Widow, that's it. Help me Internet) on them. I've captured some gameplay of each table for you below to make your own mind up if you fancy getting this pack next week. Like I said above, even without a deep love of Marvel I love a game of pinball, and once again Zen Studios offer a pair of decent tables for fans of either Marvel and/or pinball. Quick thoughts on these tables, as a massive review isn't really needed or indeed an easy thing to do, I like what I played. The A force table feels very much like the table that saw most of the attention put into it, but the Champions table offers a much more frantic pace, thanks to it being full of ramps. Both though offer a fun experience for those looking to kill an hour or two when you just fancy chilling out and playing something simple. You can pick up this DLC for Pinball FX2 for just £5.59/$6.99 by clicking here.